Mahella australiensis Bonilla Salinas et al. 2004 is the type species of the genus Mahella, which belongs to the family Thermoanaerobacteraceae. The species is of interest because it differs from other known anaerobic spore-forming bacteria in its G+C content, and in certain phenotypic traits, such as carbon source utilization and relationship to temperature. Moreover, it has been discussed that this species might be an indigenous member of petroleum and oil reservoirs. 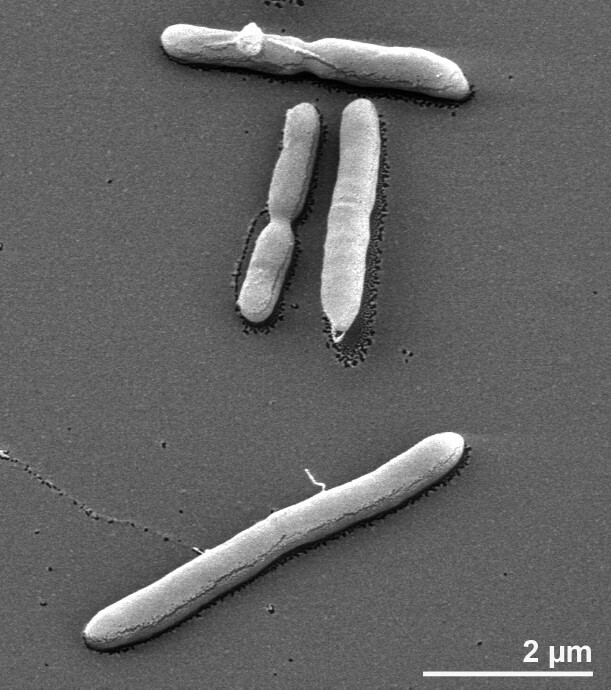 This is the first completed genome sequence of a member of the genus Mahella and the ninth completed type strain genome sequence from the family Thermoanaerobacteraceae. 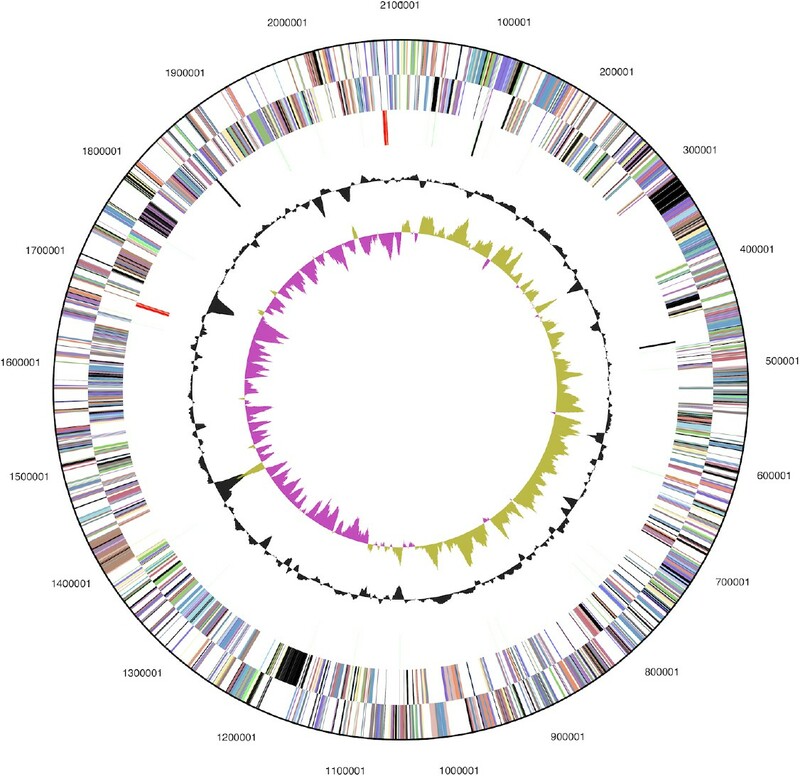 The 3,135,972 bp long genome with its 2,974 protein-coding and 59 RNA genes is a part of the Genomic Encyclopedia of Bacteria and Archaea project. Strain 50-1 BONT (= DSM 15567 = CIP 107919) is the type strain of Mahella australiensis, and the type and only species of the monotypic genus Mahella [1,2]. The genus name is derived from the Neo-Latin word Mahella (named in honor of the American microbiologist R. A. Mah, for his important contribution to the taxonomy of anaerobes) . The species epithet is derived from the Neo-Latin word australiensis (related to Australia) . Strain 50-1 BONT was isolated from the Riverslea Oil Field in the Bowen-Surat basin in Queensland, eastern Australia . No further isolates have been reported for M. australiensis. Here we present a summary classification and a set of features for M. australiensis 50-1 BONT, together with the description of the complete genomic sequencing and annotation. A representative genomic 16S rRNA sequence of M. australiensis was compared using NCBI BLAST under default settings (e.g., considering only the high-scoring segment pairs (HSPs) from the best 250 hits) with the most recent release of the Greengenes database  and the relative frequencies, weighted by BLAST scores, of taxa and keywords (reduced to their stem  were determined. The three most frequent genera were Clostridium (76.6%), Mahella (18.5%) and Pelotomaculum (4.8%) (36 hits in total). Regarding the two hits to sequences from members of the species, the average identity within HSPs was 99.9%, whereas the average coverage by HSPs was 100.0%. Among all other species, the one yielding the highest score was Pelotomaculum isophthalicicum, which corresponded to an identity of 88.5% and a HSP coverage of 49.0%. (Note that the Greengenes databases uses the INSDC (= EMBL/NCBI/DDBJ) annotation, which is not an authoritative source for nomenclature or classification.) The highest-scoring environmental sequence was DQ378192 (‘oil-polluted soil clone F28 Pitesti’), which showed an identity of 98.5% and a HSP coverage of 98.0%. The five most frequent keywords within the labels of environmental samples which yielded hits were ‘microbi’ (3.7%), ‘anaerob’ (2.9%), ‘digest’ (2.2%), ‘soil’ (2.0%) and ‘thermophil’ (1.7%) (213 hits in total). The five most frequent keywords within the labels of environmental samples which yielded hits of a higher score than the highest scoring species were ‘microbi’ (4.4%), ‘anaerob’ (3.3%), ‘digest’ (3.2%), ‘soil’ (2.6%) and ‘condit, denitrification-induc, paddi, popul, respons, rice’ (1.9%) (123 hits in total). These keywords reflect some of the ecological and physiological properties reported for strain 50-1 BONT in the original description . Figure 1 shows the phylogenetic neighborhood of M. australiensis 50-1 BONT in a 16S rRNA based tree. The sequences of the three 16S rRNA gene copies in the genome differ from each other by up to two nucleotides, and differ by up to four nucleotides from the previously published 16S rRNA sequence (AY331143). Phylogenetic tree highlighting the position of M. australiensis strain 50-1 BONT relative to the other type strains within the order Thermoanaerobacterales. The tree was inferred from 1,275 aligned characters [5,6] of the 16S rRNA gene sequence under the maximum likelihood criterion  and rooted in accordance with the current taxonomy. The branches are scaled in terms of the expected number of substitutions per site. Numbers to the right of bifurcations are support values from 950 bootstrap replicates  if larger than 60%. Lineages with type strain genome sequencing projects registered in GOLD  are labeled with one asterisk, those registered as ‘Complete and Published’ with two asterisks [10,11]. Apparently, even the best BLAST hits show a low degree of similarity to M. australiensis (see above), in agreement with the isolated position of the species in the latest version of the 16S rRNA phylogeny from the All-Species-Living-Tree Project . The species selection for Figure 1 was based on the current taxonomic classification (Table 1). The cells of strain 50-1 BONT are generally rod-shaped with a size of 3–20 x 0.5 µm (Figure 2). They occur singly or in pairs . Strain 50-1 BONT stains Gram-positive and is spore-forming (Table 1). The organism is described to be motile by peritrichous flagella, with a mean of four flagella per cell  (not visible in Figure 2). Strain 50-1 BONT was found to be a strictly anaerobic chemoorganotroph which requires 0.1% NaCl for optimal growth , but is also able to grow in the presence of up to 4% NaCl . The organism can use a wide range of carbohydrates as carbon and energy sources, including arabinose, cellobiose, fructose, galactose, glucose, mannose, sucrose, xylose and yeast extract . Lactate, formate, ethanol, acetate, H2, and CO2 are the end products of the glucose metabolism . The temperature range for growth is between 30°C and 60°C, with the optimum at 50°C . Mesothermophilia distinguishes M. australiensis from its closest relatives, such as the members if the genus Thermoanaerobacterium . After seven days of incubation at 50°C, round colonies (1–2 mm diameter) were found in roll tubes . The pH range for growth is between 5.5 and 8.8, with an optimum at pH 7.5 . Strain 50-1 BONT was not able to reduce thiosulfate or to hydrolyze starch . Moreover, it does not use elemental sulfur, sulfate, sulfite, nitrate or nitrite as electron acceptors . The generation time of the strain 50-1 BONT was 11 h .
Classification and general features of M. australiensis 50-1 BONT according to the MIGS recommendations  and the NamesforLife database . No chemotaxonomic information is currently available for the strain 50-1 BONT. M. australiensis 50-1 BONT, DSM 15567, was grown anaerobically in DSMZ medium 339 (Wilkins-Chalgreen anaerobe broth, Oxoid CM 643)  at 50°C. DNA was isolated from 0.5–1 g of cell paste using Jetflex Genomic DNA Purification Kit (GENOMED 600100) following the standard protocol as recommended by the manufacturer. Cell lysis was enhanced by adding 20 µl proteinase K for two hours at 58°C. DNA is available through the DNA Bank Network . The genome was sequenced using a combination of Illumina and 454 sequencing platforms. All general aspects of library construction and sequencing can be found at the JGI website . Pyrosequencing reads were assembled using the Newbler assembler (Roche). The initial Newbler assembly consisting of 40 contigs in one scaffold was converted into a phrap  assembly by making fake reads from the consensus, to collect the read pairs in the 454 paired end library. Illumina GAii sequencing data (444 Mb) was assembled with Velvet  and the consensus sequences were shredded into 1.5 kb overlapped fake reads and assembled together with the 454 data. The 454 draft assembly was based on 108.4 Mb 454 draft data and all of the 454 paired end data. Newbler parameters are -consed -a 50 -l 350 -g -m -ml 20. The Phred/Phrap/Consed software package  was used for sequence assembly and quality assessment in the subsequent finishing process. After the shotgun stage, reads were assembled with parallel phrap (High Performance Software, LLC). Possible mis-assemblies were corrected with gapResolution , Dupfinisher, or sequencing cloned bridging PCR fragments with subcloning . Gaps between contigs were closed by editing in Consed, by PCR and by Bubble PCR primer walks (J.-F. Chang, unpublished). A total of 279 additional reactions were necessary to close gaps and to raise the quality of the finished sequence. Illumina reads were also used to correct potential base errors and increase consensus quality using a software Polisher developed at JGI . The error rate of the completed genome sequence is less than 1 in 100,000. Together, the combination of the Illumina and 454 sequencing platforms provided 88.0 × coverage of the genome. The final assembly contained 364,783 pyrosequence and 4,541,603 Illumina reads. The genome consists of a 3,135,972 bp long chromosome with a G+C content of 43.5% (Table 3 and Figure 3). Of the 3,033 genes predicted, 2,974 were protein-coding genes, and 59 RNAs; 104 pseudogenes were also identified. The majority of the protein-coding genes (70.4%) were assigned with a putative function while the remaining ones were annotated as hypothetical proteins. The distribution of genes into COGs functional categories is presented in Table 4. 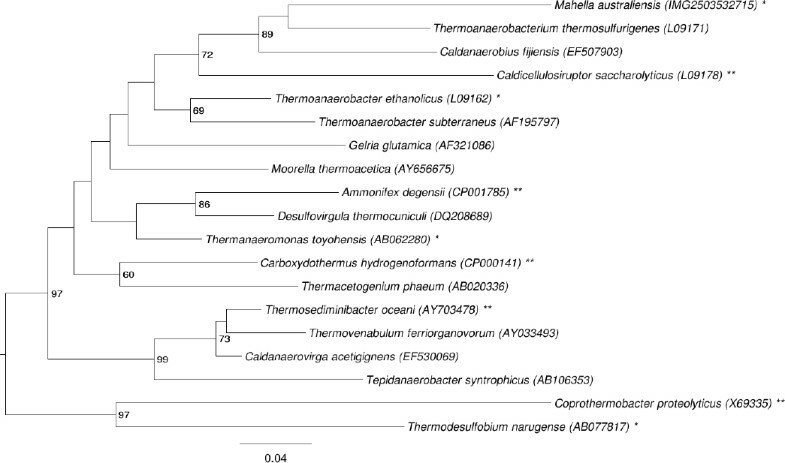 Lacking an available genome sequence of the closest relative of M. australiensis, (Thermoanaerobacterium thermosulfurogenes, Figure 1), the following comparative analyses were done with Thermoanaerobacterium thermosaccharolyticum (GenBank CP002171), the closest related organism with a publicly available genome. While the two genomes are similar in size (M. australiensis 3.1 Mb, 2,974 genes; T. thermosaccharolyticum 2.8 Mb, 2,757 genes), they differ significantly in their G+C content (43% vs. 34%). An estimate of the overall similarity between M. australiensis, T. thermosaccharolyticum and Caldicellulosiruptor saccharolyticus  (GenBank EKD00000000.1, as an equidistant outgroup, Figure 1), was generated with the GGDC-Genome-to-Genome Distance Calculator [36,37]. This system calculates the distances by comparing the genomes to obtain HSPs (high-scoring segment pairs) and inferring distances from the set of formulae (1, HSP length / total length; 2, identities / HSP length; 3, identities / total length). Table 5 shows the results of the pair wise comparison between the three genomes. Pairwise comparison of M. australiensis, T. thermosaccharolyticum and C. saccharolyticus using the GGDC-Calculator. The fraction of shared genes in the three genomes is shown in a Venn diagram (Figure 4). The numbers of pairwise shared genes were calculated with the phylogenetic profiler function of the IMG ER platform . The homologous genes within the genomes were detected with a maximum E-value of 10-5 and a minimum identity of 30%. About half of all the genes in the genomes (1,313 genes) are shared among the three genomes, with equivalent numbers of genes (265 to 327) shared pairwise to the exclusion of the third genome or occurring in only one genome (866 to 1,069). Within the 1,069 unique genes of M. australiensis that have no detectable homologs in the genomes of T. thermosaccharolyticum and C. saccharolyticus (under the sequence similarity thresholds used for the comparison) the 16 genes encoding xylose isomerases appear to be noteworthy; for seven of these isomerase genes no homologs were detected in the other two genomes; only nine genes were identified in C. saccharolyticus, and five in T. thermosaccharolyticum. The high number of xylose isomerise genes suggests a strong utilization of pentoses by M. australiensis. It is already known that several members of the order Thermoanaerobacterales are capable of xylose metabolism . In addition, a number of extracellular solute-binding proteins were found in the genome of M. australiensis. These proteins belong to a high affinity transport system, which is involved in active transport of solutes across the cytoplasmic membrane. The M. australiensis genome contains 54 genes coding for solute-binding proteins belonging to family 1, whereas in C. saccharolyticus and T. thermosaccharolyticum contain only 16 and 13 solute-binding protein family 1 coding genes, respectively. Venn diagram depicting the intersections of protein sets (total number of derived protein sequences in parentheses) of M. australiensis, T. thermosaccharolyticum and C. saccharolyticus. T. thermosaccharolyticum probably transports sugars via a phosphotransferase system (PTS). 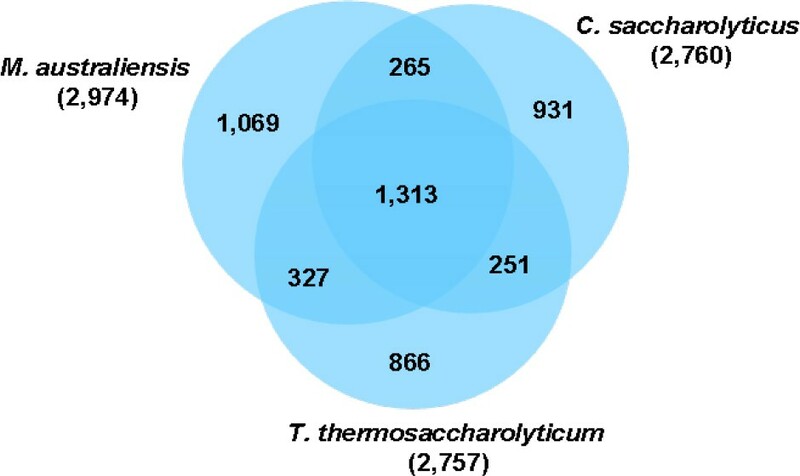 A total of 29 genes coding for proteins belonging to the PTS specific for different sugars were found in the genome of T. thermosaccharolyticum. The PTS of Thermoanaerobacter tengcongensis was recently studied in detail , with 22 proteins identified as participants in the PTS. In contrast, no genes coding for PTS proteins were identified in the genome of M. australiensis, and only one fructose specific PEP-dependent PTS gene was reported in C. saccharolyticus . In conclusion, the number and distribution of these transport mechanisms seems to be highly variable within the Thermoanaerobacteraceae. We would like to gratefully acknowledge the help of Katja Steenblock for growing M. australiensis cultures, and Susanne Schneider for DNA extractions and quality control (both at DSMZ). This work was performed under the auspices of the US Department of Energy Office of Science, Biological and Environmental Research Program, and by the University of California, Lawrence Berkeley National Laboratory under contract No. DE-AC02-05CH11231, Lawrence Livermore National Laboratory under Contract No. DE-AC52-07NA27344, and Los Alamos National Laboratory under contract No. DE-AC02-06NA25396, UT-Battelle and Oak Ridge National Laboratory under contract DE-AC05-00OR22725, as well as German Research Foundation (DFG) INST 599/1-2.